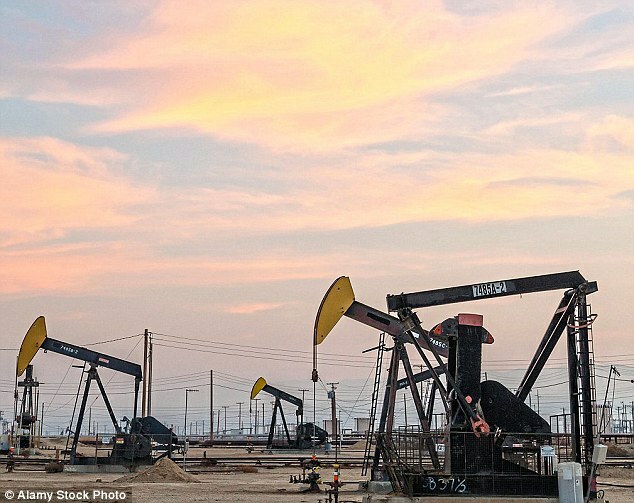 Oil giant BP is splashing out £8billion on thousands of acres of land containing 4.6billion barrels of oil and gas in the United States. It is snapping up miner BHP Billiton’s shale operations in Texas and Louisiana in its biggest deal in 20 years, with bosses and analysts saying it would transform the business. The wells in the oil-rich Permian, Eagle Ford and Haynesville basins produce around 190,000 barrels of oil a day. The deal puts BP at the heart of the boom in production from US shale rock that has upended global markets, putting the US on course to become a net oil exporter by 2025. The deal marks a major turning point for BP after years of retrenchment following the 2010 Deepwater Horizon disaster. Some 11 people died when a rig exploded in the Gulf of Mexico, costing the company around £49billion. BP has swooped for 5,500 drilling locations across 470,000 acres of land in a major bet on assets that BHP had to offload under pressure from shareholders after blowing billions. BHP bought at the peak of the oil boom in 2011 and invested heavily until the oil price collapsed. Doubts have been raised over whether growth in the Permian basin will slow as the pipes and other equipment aren’t being built fast enough. David Lawler, boss of BP’s US Lower 48 onshore oil and gas explorer, said his teams had spent the last four years improving how efficiently they get oil and gas out of the rocks. The oil price has also risen to around $ 70 per barrel. BP is paying for the wells in cash, of which about half will be raised by issuing shares. It will then sell about £4.5billion worth of other assets to buy back shares in return. Bosses also announced a rise in its quarterly dividend to shareholders, paying out 10.25 cents per share, up by 2.5 per cent, its first increase in 15 quarters. BP’s profits jumped 71 per cent during the first three months of the year to £1.9billion and it started seven projects during 2017, including gas production in Egypt and Oman. Shares have climbed nearly 60 per cent since lows of around 322p following Deepwater Horizon.